Today I went to Babies 'R' Us to use a Birthday Coupon we got in the mail. The plan was to get an umbrella stroller for our summer travels, but I came out with a little more... 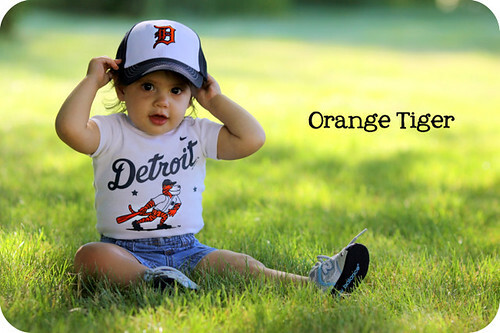 THE CUTEST Detroit Tigers hat EVER! And since Josefine looks just dazzling in ballcaps, I had to get it (not to mention she already had a matching onsie, which made the deal pretty irresistable). You could also say it was an early Father's Day gift. Well, Jim absolutely adored it and thanked me for getting it, even! See...coming out of a store with more than what you planned on getting isn't all bad. And of course, I noticed the orange highlights in both the hat and the onsie were perfect for today's entry!